New personnel with a different focus in its crosshairs; this encapsulates the ‘Devin Townsend Project’ with only two records in. It’s an obvious ploy made by Townsend, to not least further his career but to keep us (and himself) guessing on the eventual output. Ki was a success. It spanned of everything deep within the Townsend vein and some. Following on from Ki was sure to be deflating. Branded a collectively ‘more fun and straight to the point’ record, Addicted! is infinitely that PR line and less. If warning shots were fired by Townsend, prior to the eventual criticism of Addicted! then we’ve taken two the chest. He’s dead right, Addicted! has no where near the same care or depth associated with Ki. You’ll be dosing on disco and pop, fused with his typical industrial metal (think a minor SYL) or you’ll be listening to incredibly straight to the point, heavy, metal. However, everything presented is expectantly polished. The ‘to the point’ material is very effective, that even outdoes a lot of his better productions under SYL. The pop or disco implementation is unpalatable, and so are the shoddy but necessary choruses. Interestingly there are about five core tracks the album manoeuvres around, (which are very much accomplished) with the commercial beef intertwining between. 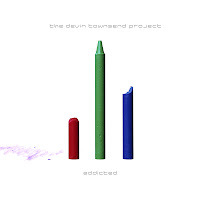 Of the four ‘Devin Townsend Projects’ (four announced, two complete) it doesn’t take half a brain cell to know that Addicted! will be on the bottom of Townsend’s barrel (mine too), when it comes to rating the albums one by one. That’s not to say this is a bad record (in fact it’s the very opposite), but suffers considerably from the negative clichés that greatness indirectly spawns. What next though, for Townsend - we can’t wait.